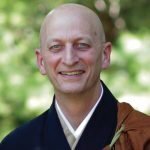 Seeking to be free of hiddenness, attachments, and partiality, Shugen Roshi inquires into this koan conversation as an example of how all aspects that feed into the student teacher relationship contribute to liberation. How do we encounter situations without getting stuck? How does living life as the larger body offer freedom, and also allow for beneficial use of those sense perceptions which previously perpetuated samsara?